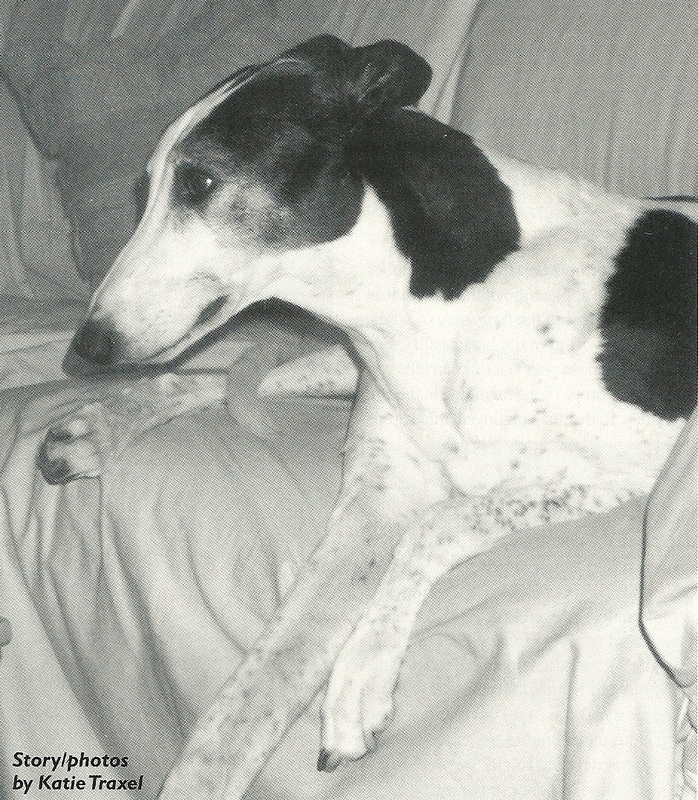 When I adopted the big, white and black, six-year-old Greyhound named Moo (MoolaMania) in March of 1997, I received more information about him than many adopters get. He was born and raced within 20 miles of my home and had been a long-time favorite pet at the adoption kennel. Moo’s history included some minor medical concerns, like hypothyroidism, for which he was medicated. He’d also had a number of infrequent seizures over the years, which required attention but no treatment. I was also told Moo couldn’t tolerate the heat. Judged too big to be fast on the shorter local tracks, his trainers hoped to send him to Florida to compete in longer races. Moo’s heat intolerance kept him in the moderate weather of Wisconsin and led to an early retirement. I took Moo home in March, which was still winter in the Midwest and my energy-saving household temperature of 65 degrees kept him comfortable. He settled in easily with my other Greyhound, Penguin, and had no real adjustment problems. As the weather warmed up, I started to notice his heat intolerance. He seemed to pant excessively after moderate exercise. Walks around the neighborhood left him breathing hard long after Penguin had recovered. At first I attributed his symptoms to his large size (85 lbs.) and being out of shape, but as the spring and summer wore on and we continued to walk daily, he didn’t seem to get any better. During this time his seizures were more frequent and with his vet’s approval, I started him on a low dose of phenobarbital. We were also working to get his thyroid supplement dose right. 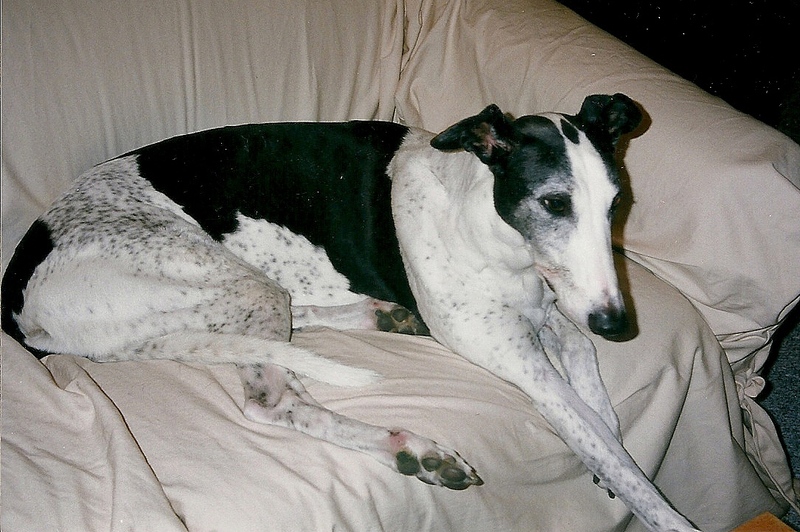 None of these problems alone was especially alarming, but I had lost a young Greyhound unexpectedly to cancer six months earlier, and I was having a hard time dealing with Moo’s seemingly unending symptoms. Once we got the seizures and thyroid level stabilized, I was sure the breathing difficulty was a sign of lung cancer or serious heart disease. In August of 1997 I took Moo to a veterinary cardiologist for consultation. The cardiologist performed a sonogram on his heart and took a complete set of chest x-rays and concluded that, aside from a very slight murmur, Moo’s heart and lungs were fine. Greatly relieved I chalked his symptoms up to just being characteristic of him. I let Moo set his own exercise agenda aside from daily walks, which he tolerated fairly well. We didn’t walk in very warm, humid weather, and the rest of the time he played or ran as much as he could. Periodic blood work showed his thyroid levels were good and stable. I gradually lowered his phenobarbital levels to a minimum and he remained seizure-free. I was feeling pretty good about Moo’s health and was reassured by the fact that his dam (mother) was still alive at 14 years of age. I wasn’t sure if I felt better or not at this point. I was almost sure something was wrong with my dog, but we couldn’t figure out what it was. Even Moo’s vet, Dr. Rebecca McCracken, one of the most experienced Greyhound veterinarians in the country, was stymied. No one was discounting his symptoms, but no one was sure how concerned I should be, including me. I was telling my tale of woe to some Greyhound friends via e-mail when one of them suggested that Moo’s symptoms seemed similar to an adoption dog they knew. That dog had been diagnosed with laryngeal paralysis! I had never heard of laryngeal paralysis, so I made a beeline to the veterinary textbooks and Dr. Becky. She was familiar with the condition in horses but had seen it only once in dogs. We did some research and made some calls. 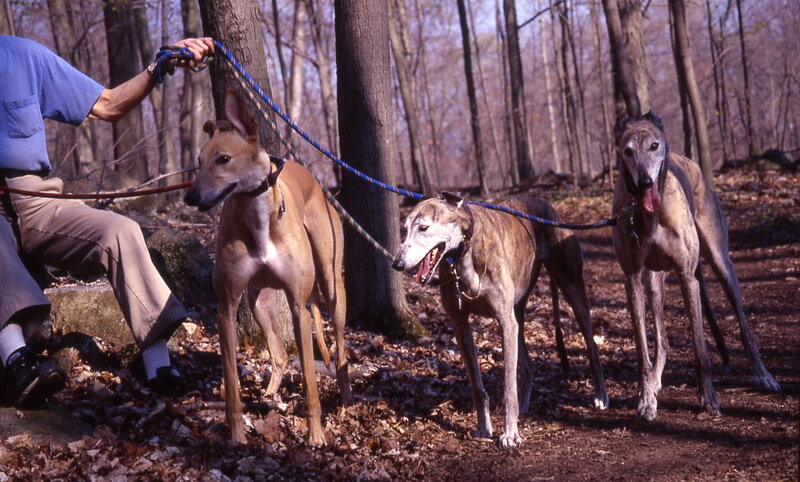 Another Greyhound e-mail friend mentioned there was a “canine laryngeal paralysis” e-mail list and home page. I subscribed immediately and consulted the experienced folks there. I found several web sites that were helpful, especially one published by The Southern California Surgical Group that included a diagram. The symptoms fit. It looked like we had a probable diagnosis! Laryngeal paralysis involves the larynx which is the voice box located in the neck. It consists of muscles that move cartilage, which opens and closes to produce sound (voice) and prevents food and water from going down into the lungs rather than the stomach. In a normal dog, the cartilage can open and close with every breath, and close with every swallow. When the dog has laryngeal paralysis, the larynx does not open fully when the dog breathes or close fully when the dog swallows. The condition is progressive, getting worse over time as the opening get narrower. There are a number of different possible causes including heredity, injury, or congenital defect. It can occur in any breed, but older dogs of larger breeds seem more prone to the condition. The symptoms can vary. Some dog owners report the first symptom they noticed was a change in the sound of the dog’s bark. I’ve never heard Moo bark. Other symptoms can include noisy breathing or asthmatic-like wheezing. According to one textbook; a mildly affected dog may fatigue easily and breathe noisily with exertion during racing, heavy work or overheating. Voice changes (e.g., hoarseness) may be present but are often not noted. Affected dogs can often cry and howl normally. Severely affected animals exhibit stridor (noisy inhalation), cyanosis (insufficient oxygen in the blood evidenced by bluish tinge to gums) and dyspnea (difficulty breathing) with mild exertion or excitement. Gagging, regurgitation, and collapse may also occur. Signs are often first noted or become worse in hot weather. All this sure sounded like my dog, and the stories of other subscribers to the e-mail list were frightening. As the disease progressed undiagnosed, dogs would collapse from a lack of oxygen. Some owners thought their dogs were having seizures, but in reality it was their desperate attempt to get enough air. I watched Moo’s ever-increasing struggle to breathe normally and decided, along with his vet, that we had to pursue this diagnosis or at least rule it out. To diagnosis laryngeal paralysis, the dog is sedated just enough to allow him to relax. He’s propped on his chest and his mouth opened and the larynx can be seen, usually with the help of an instrument called a laryngoscope. The cartilage of the larynx is observed to see if it opens and closes naturally. Moo’s vet and I sedated him one evening and took a look. It was obvious his larynx was paralyzed. We had a diagnosis; the next step was treatment. The treatment is surgery to recreate the opening so the dog can breathe. The most common surgery is arytenoid lateralization or laryngeal tieback. The cartilage is tied to one side, increasing the size of the opening. Dr. Becky referred us to the University of Wisconsin’s Veterinary Teaching Hospital where Moo was seen by one of the soft-tissue surgery professors. Dr. McAnulty confirmed the diagnosis and kept him for surgery the following day. He warned me of possible side effects, including aspiration pneumonia, coughing, and difficulty eating for some time after surgery. He also advised me there was nothing I could have done to prevent this condition and even if we had diagnosed it sooner, we probably would have waited until about this point to do surgery. Sometimes the condition can be controlled for a while by keeping the dog quiet, but eventually surgery is necessary. Dr. McAnulty also warned me that to protect Moo’s larynx after surgery, he would never be able to wear a collar again, only a harness. He would also have to have his food and water bowl elevated and be watched carefully as he learned to eat and drink again. Moo had the tieback surgery Friday morning and came home Saturday afternoon. He had a long incision in his neck and was feeling pretty sorry for himself, but the difference in his breathing was amazing. For the first time in years, he lay quietly and breathed normally. He could even breathe with his mouth closed, the first time I had ever seen him do that. It took a couple of weeks for him to learn to eat and drink without coughing and gagging. He still sometimes sounds like a very old man clearing his throat first thing in the morning, and he’s had one mild bout of aspiration pneumonia that was easily treated with antibiotics. His incision healed without incident and all the hair has grown back. As I’m writing this, Moo is 10 weeks post-op. The change in his breathing and attitude is amazing. He has energy and pep again. After three weeks of restricted exercise following surgery, he is taking walks again and building up his stamina. He plays and throws toys around. The most amazing change: he now gets cold! He seeks out warm places and will even sleep under the covers — this from a dog who was never cool enough before. Not all dogs have such an uneventful surgery or recovery and the experience of the surgeon and condition of the dog can certainly affect the outcome. Without the surgery, however, the outcome would have been tragic. I consider both Moo and I fortunate to have been steered in the right direction toward finding a diagnosis. We are also fortunate in having an open-minded vet in Dr. McCracken and a skilled surgeon in Dr. McAnulty. I’m looking forward to Moo living at least as long as his mother, who died peacefully last year at 15 years of age. Hi Nancy – many thanks for this, I am having a problem viewing sadly it seems as if perhaps I need a Yahoo account to fully view these.. so will have to set up unless there is another way that you or anyone knows? I am with aol currently. Caron, the group to which I was referring is a YahooGroup, web address http://pets.groups.yahoo.com/group/LP/. This is not the only LP list but it is the one that I found most helpful. You can find other lists by going to YahooGroups and typing laryngeal paralysis in the search box. I wish you and remarkable Tara many more happy and comfortable years! I’m delighted the article was inspiring to you. That’s one of the reasons I do this site – to help and encourage people. :). Having coped with quite a bit in life (she was my late husbands dog! ),crisis management, hand feeding etc.. I wanted mainly to know given the issues of Pneumonia after this op, best ways to feed etc, her bowls have always been on a stand as was advised that even as a pup best to do with deep chested dogs.. you say ‘greatest asset was LP list’ where did you see this please as sounds as if that would be just what we need too? Congratulations to you and to Moo! The condition’s diagnosis is often difficult to reach, as you found out, but when it is, it’s wonderful to know there are ways to help improve the quality of life in our beloved puppers. When it was determined our Sugar had LP, our education about it began. To us, the greatest asset we found was the LP list; it was of incredible value to us. From suggestions for easily eaten foods and methods of serving water to avoid aspiration pneumonia to planning a “recovery” activity schedule, the list gave us suggestions, ideas, understanding (in layman’s terms!) and the knowledge that others had been through this, successfully! Sometimes that’s what you need the most. Thank you Katie, for an excellent article on this frightening, dangerous condition. It is NOT an automatic death sentence for our dogs. By educating ourselves, and if need be others, about LP and it’s treatments, we can guarantee our puppers the full, healthy lives they deserve.